“Bold, direct and intensely fun”, is how a twitter follower described this album to me and I have no reason not to agree. This album is one of the few that I wish I had heard about years before I bought it. 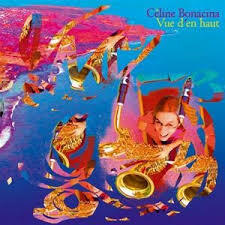 There are many great baritone saxophonists out there and Céline Bonacina is one that is not often spoken of but should be. Her playing is fiery and passionate but also metered and controlled. It is a fantastic combination for this small group. This album surprised me in ways that I hadn’t expected. The first is that throughout the entire album she can heard only on saxophones and her voice. That’s it, no alto, bass clarinet, flute, bass flute, whistles, or other woodwind. Every horn she plays is an saxophone. Which may not seem like that big of a deal but in listening to dozens of baritone albums this characteristic stands out. It is very common on bari albums for the saxophone player to play other non saxophones.For example, Denis DiBlasio is a great flautist and places a tune or three on flute in every album. Brian Landrus, a fantastic player often reviewed here, places on average 2 to 3 tunes with bass or alto clarinet.The only bari players without a non-saxophone track in my collection is Gerry Mulligan, Del Dako, Ronnie Cuber, and Gary Smulyan. Again, I don’t think I have a single album in which I don’t double on a clarinet or flute. I’m not complaining it’s just that it is noticable when an album is all saxophone from the soloist. Bonacina’s improvised solos sometimes hint at elements of Michael Brecker and James Carter, which on baritone is quite a feat. She uses multiphonics and extended techniques to create an unique atmosphere. She does this well without resorting the musical vulgarity that Carter can command at a moments notice. Her screaming multiphonics and mouthpiece pops are inline with the expression shes trying to convey and once that moment passes they fade back out of her vocabulary. Bonacina’s is a husky but penetrating contemporary tone with a clear tonal center. It is a unique tone that she carries into all of the saxophones she plays on the album. Because she plays Alto and soprano sax on the album the listener can distill the essence of her personal tone as it is the same across the horns. In other words she sounds like herself on all of the horns. Personally I find her soprano tone a fantastic blend of the open throatedness of a great bari embouchure and the semi-relaxed embouchure of a great soprano tone. I would emulate her soprano tone if I were to begin playing one. Another unexpected treat on this album is the vocals. They are also performed by Bonacina. She is clearly a lady of multiple talents and knows how to share them humbly. On the tracks in which she is also singing they voice is used as an instrument within the group. Her voice completes chords and liens with a smooth texture that only the voice can bring. It is a rare treat to have a baritone soloist take a vocal solo or sings background figures behind their own record solos. TAKE AWAY: I enjoyed the variety and playing on display on this album. This album was an impulse buy that sat just waiting for me to remember it. I’m glad I did and I suggest that you get a copy for yourself.